Dr. Kuo is an Associate Professor, Department of Medicine, Section of Hematology/Oncology, University of Arizona School of Medicine and a staff Radiologist at Southern Arizona Veterans Administration Hospital, Tucson, AZ. Dr. Griffith is a Resident in Internal Medicine at the University of Chicago School of Medicine. Dr. Abu-Alfa is an Associate Professor, Department of Internal Medicine, Section of Nephrology; Dr. Bucala is a Professor, Department of Medicine, Section of Rheumatology; Ms. Carlson is a Physician Assistant, Department of Dermatology; Dr. Girardi is an Associate Professor, Department of Dermatology; Dr. Weinreb is a Professor, Department of Diagnostic Radiology; and, Dr. Cowper is an Associate Professor, Department of Dermatology, Dermatopathology Service, Yale University School of Medicine, New Haven, CT. In the last 3 years, revelations linking gadolinium-based contrast agents(GBCAs) and nephrogenic systemic fibrosis (NSF) have had atremendous impact on the utilization of enhanced magnetic resonance imaging (MRI) in patients with kidney disease. Virtually unknown to the radiology community prior to 2006, NSF has generated significant concern and confusion among radiologists, clinicians and patients. NSF is a systemic fibrosing disorder with predominant skin involvement in most patients. In many patients, the disease manifests as a rapidly progressive, crippling disorder akin to scleroderma. In the relatively brief period of time since the emergence and recognition of NSF, policies have been developed, modified and remodified, as physicians and regulatory agencies attempt to understand the magnitude of the problem and the risk-to-benefit ratio of using GBCAs in patients with compromised renal function. Since many physicians (including most radiologists) have not encountered a patient with NSF, the first goal of this article is to familiarize the reader with the clinical manifestations of NSF. The second goal is to introduce a strategy to reduce the risk of NSF. This strategy has three prongs: 1) defining those at risk; 2) identifying them in practice, and; 3) minimizing their risk. This article reviews the controversies and proposes a strategy for NSF risk reduction. Early in 1997, physicians at a Southern California medical center were confronted with a mysterious clinical entity. 1,2 Several patients in their hemodialysis center began experiencing cutaneous induration and erythema of the limbs unassociated with fever, but frequently accompanied by pruritus, and sometimes pain. These patients experienced progressive hardening and thickening of the skin that did not resolve with dialysis. The California patients did not have inflammatory infiltrates or paraprotein, however, and their clinical involvement was mostly limited to the extremities, with the lower extremities more severely affected than the upper extremities. Fibrosis was profound, and it was sometimes associated with mucin deposition. Plasma cells were absent. Further epidemiologic investigation carried out by the Centers for Disease Control and Prevention (CDC) identified no evident common factor to these patients except their renal disease and their skin findings. 5 Although the abruptness of the disease appearance suggested a possible toxic or infectious insult, none was identified in a case-matched evaluation carried out by the CDC. In 2003, researchers determined that the fibrosis of NFD seemed to be mediated by cells arriving via the circulation-so called circulating fibrocytes (CF). 7 CFs were first characterized in 1994 in a mouse model of wound repair, and subsequent investigation had proven they were critical mediators in the process of normal healing following tissue injury. Evidently, the CFs of NFD were acting as if the skin had been injured-depositing mucin, collagen and elastin in a parody of normal wound healing. Somehow the milieu of a patient with renal compromise and related issues was providing a permissive environment for this to occur. It is unknown why the cells begin migrating to the dermis. Nephrogenic fibrosing dermopathy was gradually observed as not merely a cutaneous process-but a systemic one. 4,7,8 The observations supporting this shift in concept included the first report of an autopsy evaluation of NFD, wherein internal, noncontiguous tissues were involved by the same mysterious fibrosis seen in the skin. 8 In addition, researchers noted the involvement of the sclerae of patients with NFD. 9 These patients developed asymptomatic, telangiectatic yellow-to-white plaques of the sclerae bilaterally. Recognizing the broader concept of a systemic process, the disease was rechristened nephrogenic systemic fibrosis (NSF). 4 As additional cases were recognized and reported, it became clear that hypercoagulability 3 was a common thread among many (but not all) of the patients with NSF and that vascular injury (as a result of surgery or endovascular catheterization) was a temporally associated event with NSF onset. These observations were intriguing, as vascular injury and clotting are early steps in the development of the inflammatory pathway that results in the recruitment of CFs capable of establishing a healing wound site. Of additional interest was the fact that nearly all cases of NSF in the Yale registry could be associated with one or both of these events and a select few that did not fit the model were known to have had neuroimaging procedures for brain tumors. 3,4 The common thread that tied these cases together was radiologic imaging (and in particular, magnetic resonance imaging). A retrospective analysis immediately ensued and the preliminary investigation confirmed that nearly all patients with NSF (in whom records could be located) had been exposed to GBCA in the weeks and months leading up to the development of NSF. While the intricacies of the exposure and risk data are still being investigated, European and American medical authorities havemoved to restrict the use of GBCA in patients with AKI or with stages 4 and 5 chronic kidney disease. As additional analyses are completed it is expected that more specific recommendations will follow. The current data support that minimization of dose and exposure to these agents will likely result in fewer and less severe cases of NSF, and that selection of agents to avoid the possibility of dissociation of the gadolinium-ligand complex will help to minimize the profound clinical effects of this devastating disease. Patients with NSF may manifest a range of cutaneous lesions. 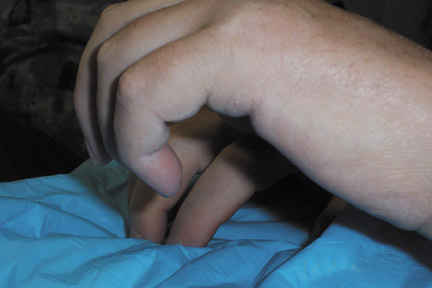 The typical clinical course begins with swelling of distal parts of the extremities and is usually followed in subsequent weeks by severe skin induration (Figure 1). Involvement may extend to the more proximal extremities and lower abdomen. The skin induration may be aggressive and associated with intermittent to constant pain, muscle restlessness and marked loss of skin flexibility. In some cases, NSF progresses to marked physical disability characterized by almost complete loss of range of motion of all extremity joints (Figure 2). Since there is no consistently effective therapy for the disease, it cannot be emphasized enough that prevention is the best strategy. As disconcerting a thought as this is, radiologists are the vector for this disease. Different GBCAs likely have varying propensitiesfor triggering NSF, but for the time being, every GBCA should be considered capable of triggering NSF. 1) Define and identify the population at risk in your practice. 2) Minimize risk to that susceptible population. It is important to estimate GFR rather than depend on serum creatinine alone to judge the presence or severity of renal disease. There are a number of equations used to estimate GFR. The abbreviated Modification of Diet in Renal Disease (MDRD) equation is recommended and used most commonly. It is advocated by many organizations including the National Kidney Foundation (www.kidney.org) and the National Kidney Disease Education Program (www.nkdep.nih.org). It is a function of serum creatinine, age, race and gender. The MDRD is obviously not a direct measure of GFR but rather a population-based formula that may have limitations when applied to patients not included in the original study population. For example, patients with hepatic cirrhosis have very low muscle mass and therefore, a significantly higher eGFR than true GFR. At our institution, we compensate for this by using an eGFR <40 mL/min/1.73 2 as a cutoff for risk in patients with cirrhosis. Formulae like the MDRD were derived from outpatients with kidney function in steady state. For the inpatient population, the MDRD equation tends to overestimate GFR. 45 Radiologists and clinicians must use caution when assessing renal function and must not overlook the clinical context when assessing eGFR values. Studies support that the risk of developing NSF is increased by both higher doses and frequent administration of GBCA. 46,47 The evidence is less clear on whether cumulative dose of GBCA over the lifetime of the patient also increases the risk but it is plausible. Importantly, while in the minority, cases of NSF after administration of a single dose of GBCA have been reported. In keeping with the hypothesis that the risk of NSF is proportional to the patient's burden of GBCA, a simple way to approach preventing NSF is to decrease the input and increase the clearance of GBCA (Figure 4). Limited data suggest that coincident infection or inflammation at the time of GBCA administration increases the risk for NSF. 48 These patients should be considered at greater risk when deciding to administer GBCA. Are some GBCAs safer than others? No GBCA can be considered absolutely free from the risk of triggering NSF. Both U.S. and European regulatory agencies share this position. Therefore, until more definitive data become available, a conservative approach would be to utilize similar preventive measures regardless of the GBCA given. Currently, nine GBCAs are approved in the USA or Europe. The different structures of the ligands (shown in Figure 5) bound to the gadolinium atom impart different imaging properties and stabilities. A comprehensive review of the stabilities of the various GBCAs is beyond the scope of this article. As displayed in Table 1, GBCAs can be organized by the two most important structural factors for stability (ionic versus nonionic and macrocyclic versus linear). The three linear ionic agents in orange are cleared both by hepatic and renal mechanisms to varying degrees. The remainder of the agents are cleared nearly exclusively by the kidney. Increasing epidemiologic and scientific data support that nonionic linear agents are more commonly associated with the disease, which could be a function of a poorly understood mechanism involving their relatively lower stabilities. 49-51 The macrocyclic agents are the most kinetically stable and are therefore expected to release the least amount of free gadolinium under conditions of prolonged retention of GBCA in patients. 52 It also should be noted that the two agents associated with the greatest number of NSF cases are also the two GBCAs that have been used most extensively worldwide and that, in part, the disparity in the number of cases associated with the various agents might be due to differences in usage and patient populations. Three of the ionic linear agents (Gd-BOPTA, Gd-EOB-DTPA and Gadofosveset) are cleared by both renal and hepatobiliary mechanisms to varying degrees. 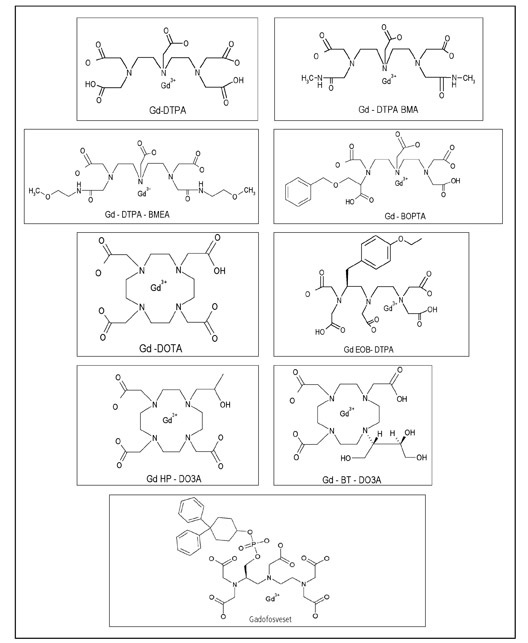 Gd-EOB-DTPA and Gadofosveset are approved in Europe and are used for hepatic and blood pool imaging respectively. Hepatobiliary clearance derives from the protein-binding property of these agents. In comparison to the typical GBCA (with virtually exclusive dependence on renal clearance), agents with a component of biliary excretion may decrease retention of Gd inpatients with kidney disease. Unfortunately, the magnitude of this difference and the impact on the risk for NSF are unknown. Therefore using an agent with both hepatobiliary and renal clearance properties is not recommended as a method of reducing NSF risk. 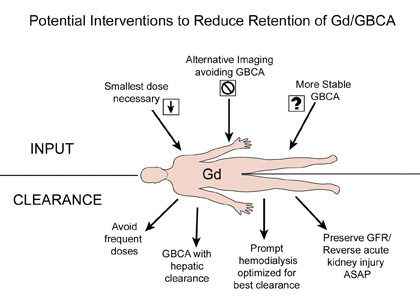 Administering a lower dose of GBCA may increase the risk of a non-diagnostic scan and may result in a higher total administered dose when a subsequent full dose is given to reach the diagnosis. Utilizing a high relaxivity contrast agent (HRCA) like Gd-BOPTA, which has approximately twice the relaxivity as a conventional GBCA with no protein binding, may allow reducing dose while maintaining efficacy. 53 However, lower doses have been proven only for selected clinical applications, and one should be careful not to reduce the dose to nondiagnostic levels in the interest of "safety." At the Yale University School of Medicine, Gd-HP-DO3A is used in the rare dialysis patient who needs intravenous contrast. It is absolutely not used in everyone because it is believed that there are more adverse events other than NSF with this agent. Avoid the use of GBCA by utilizing alternative imaging that does not require GBCA. In consultation with the ordering physician, we consider alternative imaging or nonimaging modalities that may provide the requested clinical diagnostic data at a lower potential risk. The benefits and risks of an MR study with the addition of contrast should be evaluated on an individual basis for each patient. Table 2 illustrates decisions for alternative imaging in five case presentations with history and imaging protocols. If the potential benefit of the enhanced MRI is judged to outweigh the risk, then obtain informed consent and administer the lowest dose necessary. Subsequent to the enhanced MRI, perform prompt hemodialysis in those patients already on hemodialysis and possibly those with AKI and rising creatinine. 53 Monitoring of the patient over the coming weeks and months also seems logical. If the patient develops NSF and is fortunate enough to benefit from therapy, early intervention with physical therapy and other reported therapeutic measures might be helpful. NSF is a systemic fibrotic disease often associated with great morbidity, and in the most severe cases, increased mortality. The greatest known risk factor for NSF is receiving a GBCA in a setting of diminished renal function. Arguably, administration of GBCA is the sine quo non of NSF. Since there is no reliable therapy at this time, prevention is the key. Calculations of eGFR are inherently inaccurate for a small percentage of patients and are inappropriate in the setting of acute kidney injury. At present, patients with stage 4 and 5 CKD are considered at risk. While patients with stage 3 CKD are theoretically at risk, the risk is extremely low and in general the benefit of the enhanced scan would outweigh the risk. Infection or inflammation coincident with administration of GBCA may increase risk for NSF. No GBCA should be considered completely free from the risk of causing NSF, but the macrocyclic class of GBCAs are likely safer. Risk increases with increasing dose ofGBCA and therefore the lowest dose sufficient to answer the indication for the MRI should be used. Physicians need to exercise caution in performing multiple enhanced MRIs in a short period of time. Utilizing an HRCA may allow for decreased dose without compromising efficacy. Prompt hemodialysis may hypothetically decrease the risk of NSF and is therefore recommended. There are no data at this time to support this practice and therefore hemodialysis cannot be considered completely protective. Consider the full-range of alternativesto enhanced MRI which may mean a less efficient work-up. Sometimes, an enhanced MRI is the gold-standard and the benefits willoutweigh the risks. Understanding of this issue is still rapidly evolving so it is imperative to keep abreast of this topic. The authors would like to thank Geri Mancini for her invaluable assistance preparing the figures for this article. Cowper SE, Robin HS, Steinberg SM, et al. Scleromyxoedema-like cutaneous diseases in renal-dialysis patients. Lancet. 2000;356:1000-1001. Cowper SE, Su LD, Bhawan J, et al. Nephrogenic fibrosing dermopathy. Am J Dermatopathol. 2001;23:383-393. Cowper SE. Nephrogenic fibrosing dermopathy: The first 6 years. Curr Opin Rheumatol. 2003;15: 785-790. Cowper S. Nephrogenic Fibrosing Dermopathy Website. In, 2001-2007. Available at http://www. pathmax.com/dermweb/. DeHoratius DM, Cowper SE. Nephrogenic systemic fibrosis: An emerging threat among renal patients. Semin Dial. 2006;19:191-194. Cowper SE, Bucala R. Nephrogenic fibrosing dermopathy: Suspect identified, motive unclear. Am J Dermatopathol. 2003;25:358. Ting WW, Stone MS, Madison KC, Kurtz K. Nephrogenic fibrosing dermopathy with systemic involvement. Arch Dermatol. 2003;139:903-906. Swartz RD, Crofford LJ, Phan SH, et al. Nephrogenic fibrosing dermopathy: A novel cutaneous fibrosing disorder in patients with renal failure. Am J Med. 2003;114:563-572. Grobner T. Gadolinium-A specific trigger for the development of nephrogenic fibrosing dermopathy and nephrogenic systemic fibrosis? Nephrol Dial Transplant. 2006;21:1104-1108. Grobner T. Gadolinium-A specific trigger for the development of nephrogenic fibrosing dermopathy and nephrogenic systemic fibrosis? [erratum appears in Nephrol Dial Transplant. 2006;21(6):1745]. Nephrol Dial Transplant. 2006; 21(4):1104-1108. Marckmann P, Skov L, Rossen K, et al. Nephrogenic systemic fibrosis: Suspected caus-ative role of gadodiamide used for contrast-enhanced magnetic resonance imaging. J Am Soc Nephrol. 2006;17:2359-2362. Deo A, Fogel M, Cowper SE. Nephrogenic systemic fibrosis: A population study examining the relationship of disease development to gadolinium exposure. Clin J Am Soc Nephrol. 2007;2:264-267. Lauenstein TC, Salman K, Morreira R, et al. Nephrogenic systemic fibrosis: Center case review. J Magn Reson Imaging. 2007;26:1198-1203. Collidge TA, Thomson PC, Mark PB, et al. Gadolinium-enhanced MR imaging and nephrogenic systemic fibrosis: Retrospective study of a renal replacement therapy cohort. Radiology. 2007;245:168-175. Kanal E, Broome DR, Martin DR, Thomsen HS. Response to the FDA's May 23, 2007, nephrogenic systemic fibrosis update. Radiology. 2008; 246:11-14. Jan F, Segal JM, Dyer J, et al. Nephrogenic fibrosing dermopathy: Two pediatric cases. J Pediatr. 2003;143:678-681. Jain SM, Wesson S, Hassanein A, et al. Nephrogenic fibrosing dermopathy in pediatric patients. Pediatr Nephrol. 2004;19:467-470. Dawn G, Holmes SC. Scleromyxoedema-like eruption following haemodialysis or nephrogenic fibrosing dermopathy? Br J Dermatol. 2004;150: 167-168. Evenepoel P, Zeegers M, Segaert S, et al. Nephrogenic fibrosing dermopathy: A novel, disabling disorder in patients with renal failure. Nephrol Dial Transplant. 2004;19:469-473. Tan AW, Tan SH, Lian TY, Ng SK. A case of nephrogenic fibrosing dermopathy. Ann Acad Med Singapore. 2004;33:527-529. Baron PW, Cantos K, Hillebrand DJ, et al. Nephrogenic fibrosing dermopathy after liver transplantation successfully treated with plasmapheresis. Am J Dermatopathol. 2003;25:204-209. Mackay-Wiggan JM, Cohen DJ, Hardy MA, et al. Nephrogenic fibrosing dermopathy (scleromyxedema-like illness of renal disease). J Am Acad Dermatol. 2003;48:55-60. Hubbard V, Davenport A, Jarmulowicz M, Rustin M. Scleromyxoedema-like changes in four renal dialysis patients. Br J Dermatol. 2003; 148:563-568. Edsall LC, English JC, 3rd, Teague MW, Patterson JW. Calciphylaxis and metastatic calcification associated with nephrogenic fibrosing dermopathy. [erratum appears in J Cutan Pathol. 2004;(7):518]. J Cutan Pathol. 2004;31:247-253. Obermoser G, Emberger M, Wieser M, Zelger B. Nephrogenic fibrosing dermopathy in two pa-tients with systemic lupus erythematosus. Lupus. 2004;13:609-612. Quan TE, Cowper S, Wu S-P, et al. Circulating fibrocytes: Collagen-secreting cells of the peripheral blood. Int J Biochem Cell Biol. 2004;36:598-606. Streams BN, Liu V, Liegeois N, Moschella SM. Clinical and pathologic features of nephrogenic fibrosing dermopathy: A report of two cases. J Am Acad Dermatol. 2003;48:42-47. Sadowski EA, Bennett LK, Chan MR, et al. Nephrogenic systemic fibrosis: Risk factors and incidence estimation. Radiology. 2007;243: 148-157. Swaminathan S, Ahmed I, McCarthy JT, et al. Nephrogenic fibrosing dermopathy and high-dose erythropoietin therapy. Ann Intern Med. 2006; 145:234-235. LeBoit PE. What nephrogenic fibrosing dermopathy might be. Arch Dermatol. 2003;139: 928-930. Boyd AS, Zic JA, Abraham JL. Gadolinium deposition in nephrogenic fibrosing dermopathy. J Am Acad Dermatol. 2007;56:27-30. High WA, Ayers RA, Chandler J, et al. Gadolinium is detectable within the tissue of patients with nephrogenic systemic fibrosis. J Am Acad Dermatol. 2007;56:21-26. Kuo PH, Kanal E, Abu-Alfa AK, Cowper SE. Gadolinium-based MR contrast agents and nephrogenic systemic fibrosis. Radiology. 2007; 242:647-649. Richmond H, Zwerner J, Kim Y, Fiorentino D. Nephrogenic systemic fibrosis: Relationship to gadolinium and response to photopheresis. Arch Dermatol. 2007;143:1025-1030. 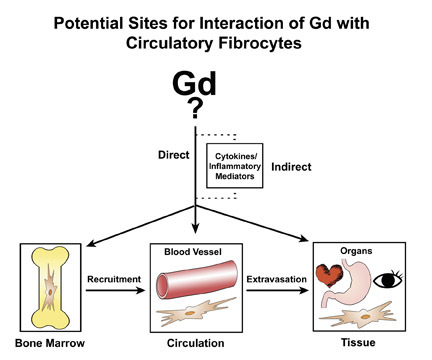 Quan TE, Cowper SE, Bucala R. The role of circulating fibrocytes in fibrosis. Curr Rheumatol Rep. 2006;8:145-150. Jimenez SA, Artlett CM, Sandorfi N, et al. Dialysis-associated systemic fibrosis (nephrogenic fibrosing dermopathy): Study of inflammatory cells and transforming growthfactor beta1 expression in affected skin. Arthritis Rheum . 2004;50:2660-2666. Mehrad B, Burdick MD, Zisman DA, et al. Circulating peripheral blood fibrocytes in human fibrotic interstitial lung disease. Biochem Biophys Res Commun. 2007;353:104-108. Schmidt M, Sun G, Stacey MA, et al. Identification of circulating fibrocytes as precursors of bronchial myofibroblasts in asthma. J Immunol. 2003;171:380-389. Chesney J, Bacher M, Bender A, Bucala R. The peripheral blood fibrocyte is a potent antigen-presenting cell capable of priming naive T cells in situ. Proc Natl Acad Sci USA. 1997;94: 6307-6312. Chesney J, Metz C, Stavitsky AB, et al. Regulated production of type I collagen and inflammatory cytokines by peripheral blood fibrocytes. J Immunol. 1998;160:419-425. Kisseleva T, Uchinami H, Feirt N, et al. Bone marrow-derived fibrocytes participate in pathogenesis of liver fibrosis. J Hepatol. 2006;45:429-438. Bucala R. Circulating fibrocytes: Cellular basis for NSF. J Am Coll Radiol. 2008;5:36-39. Poggio ED, Nef PC, Wang X, et al. Performance of the Cockcroft-Gault and modification of diet in renal disease equations in estimating GFR in ill hospitalized patients. Am J Kidney Dis. 2005; 46:242-252. Prince MR, Zhang H, Morris M, et al. Incidence of nephrogenic systemic fibrosis at two large medical centers. Radiology. 2008; 248:807-816. Broome DR, Girguis MS, Baron PW, et al. Gadodiamide-associated nephrogenic systemic fibrosis: Why radiologists should be concerned. AJR Am J Roentgenol. 2007;188:586-592. Golding LP, Provenzale JM. Nephrogenic systemic fibrosis: Possible association with a predisposing infection. AJR Am J Roentgenol. 2008;190: 1069-1075. Edward M, Quinn JA, Mukherjee S, et al. Gadodiamide contrast agent 'activates' fibroblasts: a possible cause of nephrogenic systemic fibrosis. J Pathol. 2008;214:584-593. Kuo PH. Gadolinium-containing MRI contrast agents: Important variations on a theme for NSF. J Am Coll Radiol . 2008; 5:29-35. Sieber MA, Pietsch H, Walter J, et al. A preclinical study to investigate the development of nephrogenic systemic fibrosis:A possible role for gadolinium-based contrastmedia. Invest Radiol. 2008;43:65-75. Idee JM, Port M, Raynal I, et al. Clinical and biological consequences of transmetallation induced by contrast agents for magnetic resonance imaging: A review. Fundam Clin Pharmacol. 2006;20:563-576. Kirchin MA, Runge VM. Contrast agents for magnetic resonance imaging: Safety update. Top Magn Reson Imaging. 2003;14:426-435. Joffe P,Thomsen HS, Meusel M. Pharmacokinetics of gadodiamide injection in patients with severe renal insufficiency and patients undergoing hemodialysis or continuous ambulatory peritoneal dialysis. Acad Radiol. 1998;5:491-502. MRI in the era of nephrogenic systemic fibrosis: Review, controversies and suggestions for risk reduction. Appl Radiol.